From the town of Flatwoods, of Braxton County, West Virginia, comes the mysterious tale of a burning craft which fell from the sky, and a mysterious being. The account began in the afternoon of September 12, 1952 when Sheriff Robert Carr and his Deputy Burnell Long received a call from witnesses who had seen the fiery object as it crashed into the earth. The unknown object had crashed on the Elk River, south of Gassaway. The natural assumption was that an airplane had faltered, and fallen from the skies. Not long afterward, a second unusual sighting was made by some school buddies at the Flatwoods School. Shortly before nightfall, four boys playing football saw something fall on a hill not far from the school playground. The boys, at first frightened, succumbed to their youthful curiosity, and headed for the sight, which was on the property of one Bailey Fisher. They proceeded up the hill, stopping at the house of Kathleen May, excitedly telling her of what they had seen. Kathleen and her two sons joined the search party. Reaching the top of the hill, Mrs. May remarked that, …the night was foggy and there was a mist in the evening air.” “… the air had a metallic smell which burned our eyes and noses.” A dog was reported to have ran ahead of the group only to return with his tail between his legs, frightened by something. Topping the hill, they could see a “glowing, hissing” object about 10 feet in diameter, about 100 yards away. Now completely dark, the night was shattered by two lights, about a foot apart. One of the boys had a flashlight, and when he turned it on the two distant lights, a creature ten foot tall appeared..”… a bright red face, bright green clothing, a head which resembled the ace of spades, and clothing which, from the waist down, hung in great folds”. Suddenly, the creature began to “float” toward them, sending the group running back down the hill to the May house, where they quickly called the Sheriff. The boys also called some of their schoolmates, and when the Sheriff arrived, the scene of the event was full of locals, who had to see the creature for themselves. Reporter A. Lee Stewart, of the “Braxton Democrat,” began interviewing witnesses of the unusual event. He would later state that all of the observers were extremely frightened by what they had encountered. Stewart, accompanied by one of Kathleen May’s sons, made their way back to where the creature had been spotted. Approaching the sight, Stewart was overwhelmed by an odd smell, but saw nothing unusual. Returning to the exact spot the next morning, Stewart could observe “skid marks” where some object had been. Sheriff Carr believed that the group had actually seen a meteor, or comet come to earth. Reaching the top of the hill, they had seen some local animal’s eyes shining through the dark, which they mistook as a monster. This explanation, though plausible, did not explain all of the eyewitness reports. The night of the monster, and the next night brought new revelations of unusual things. A resident of Birch River testified that he had seen a “bright, orange” object circling overhead the Flatwoods area. A woman and her mother stated that they also had seen the tall creature, about eleven miles from the spot of the first sighting. Well known investigator John Keel would make observations from the Flatwood incident also. Keel found one more couple, who had observed the monster, and had also seen unusual objects over the area. The case was also investigated by naturalist Ivan Sanderson, who took soil samples, and eye witness reports. His findings were not made public. 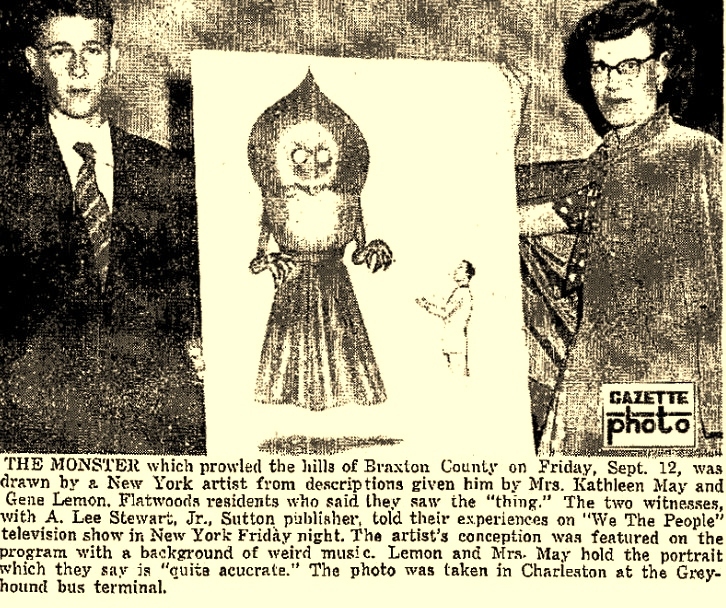 The 1952 events of Flatwoods remain a mystery.